We don’t usually report on BMX riders on MTB Shorts, but this time around we really think it’s important that we do. Sadly though, it’s not good news. Local BMX sensation, Sifiso Nhlapo, had to undergo emergency surgery on Monday night after a crash, during a practice session in Norway, left him with two fractured vertebrae in his neck. 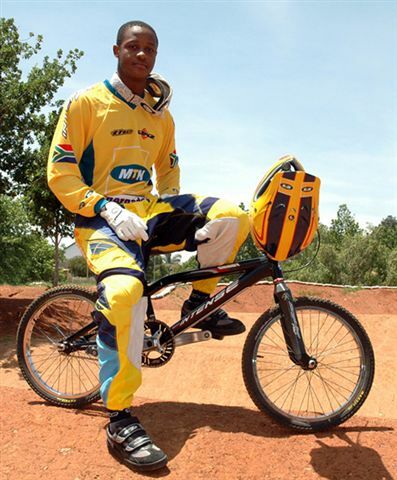 Sifiso made international headlines when he reached the inaugural BMX final at the 2008 Beijing Olympic Games. Since then he’s been on a hot streak claiming a bronze medal at the 2008 World Championships, and is currently No. 1 in Europe and No. 4 in the world. From everyone at MTB Shorts, we wish Sifiso a speedy and healthy recovery. For updates on Sifiso’s condition please visit www.skizo105.com. This entry was posted in Hot Off the Press and tagged beijing olympic games, bmx, cycle, cycling, injury, mountain bike, mountain biking blog, mtb, mtb shorts, mtn, sifiso nhlapo by mtbshorts. Bookmark the permalink.